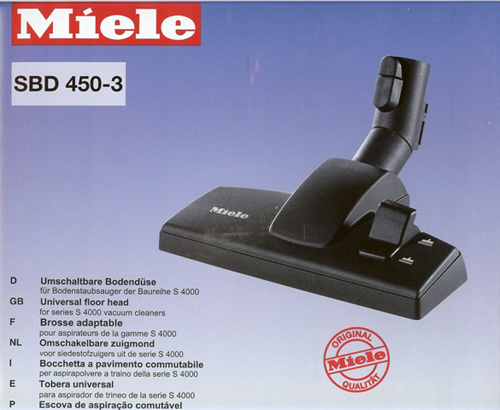 Fits Miele S4000 and S5000 Series Vacuum Cleaners. This is a combination tool with a top mounted lever to switch between carpets and bare floors. For bare floors a brush strip along the front and squeegee along the back pop out to provide soft, non-scratching cleaning action. Notches along the front of the brush allow dirt to easily enter the nozzle. For carpets and rugs, the brush strip and squeegee are recessed, allowing the channeled steel sole plate to contact the carpet, pulling air through the nap to clean it. A soft, non-scratching roller under the elbow bears any downward pressure, enabling the nozzle to glide gently over the floor.